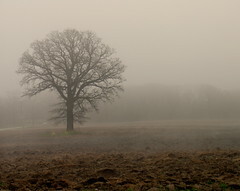 The fog envelopes my face and bare arms as I cross Braverman’s farm. The harvest is long over and the field lies fallow. The ground is wet and yields under my feet. Seedlings of bean sprouts from the last crop push their way through the muck. “I’ll be waiting for you just beyond the lone tree,” he said. I walk slowly, savoring the anticipation of hot breath against cold skin.